From sea level to cloud level. “What have I gotten into? And: Why? I ask myself lying on the ground, exhausted. I have a stitch and clear signs of hypoglycemia. I try to focus on my breath and watch the blue sky, the rocks towering high over me. I am just about halfway through. I still have to go up. I try to calm down, fight down the rising doubts. I check my offline OpenStreetMap-App on my phone. I am lucky, there should be food in less than a kilometer. 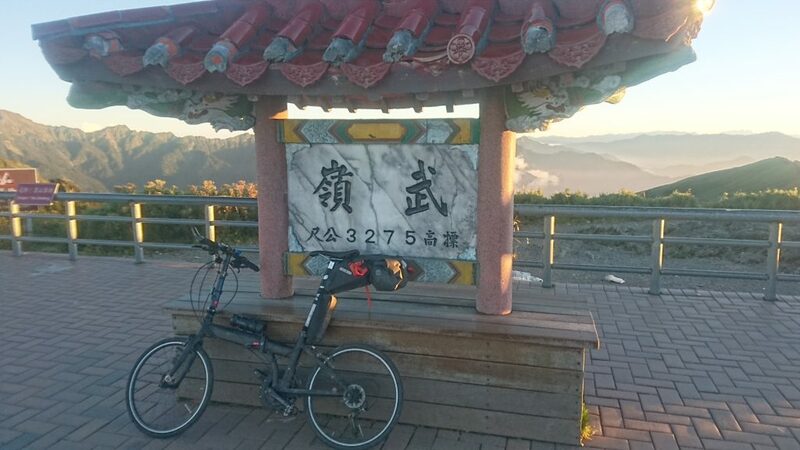 I get up again on my bike, ready to continue to push up Mount Hehuan in an attempt to ride up on Taiwan’s highest road pass, a road winding up from sea level to an altitude of 3275 meters. 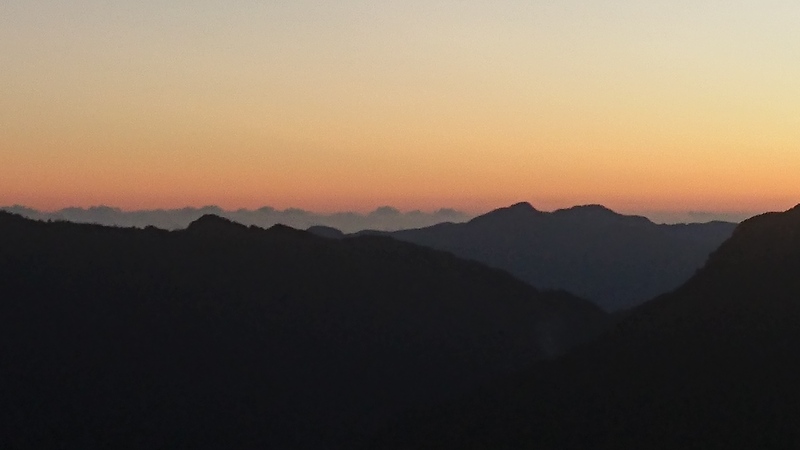 According to Wikipedia Hehuanshan is also called Joy Mountain. At the moment, however, it’s an ordeal. 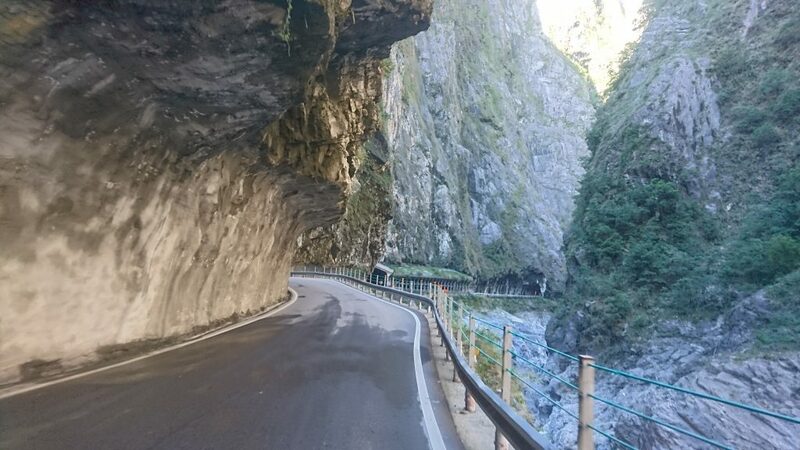 I am not in for the competition along with several hundred other riders however, I am in for one of the world’s supposedly most epic climbs through the gorges, climate zones, and gradients up to 27% on its steepest sections. I have made modifications to the original route. 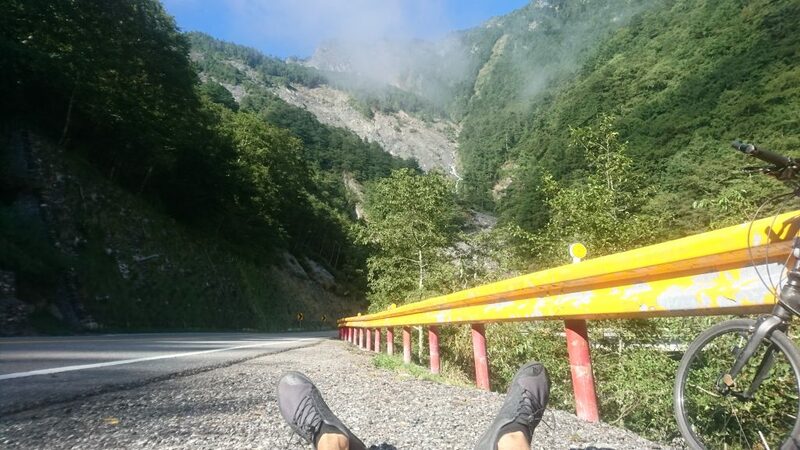 I found a cheap hostel in the nearest village – called “Taroko Susi Space” – and I will not stop at the summit to return by bus. 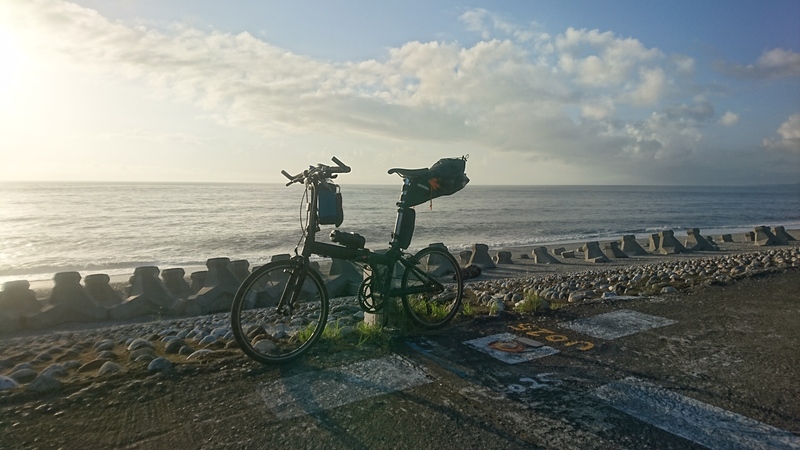 I sneaked out under rolling shutters early morning just after sunrise and had a first pit stop for breakfast at Seven Eleven before I went down to the coast to turn the sea level start into factual instead of symbolic reality. I briefly stared at the waves and the rising sun, I captured photographic proof, then embarked on the long and tough journey. 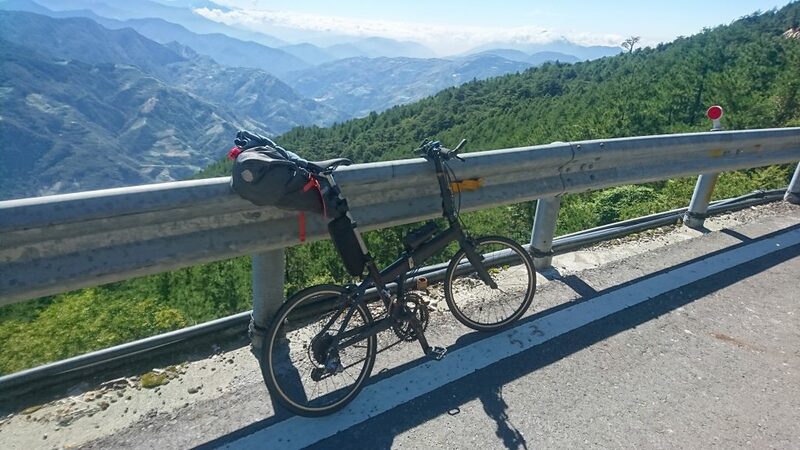 As opposed to the racers, I don’t have a light carbon road bike, I ride a pimped Chinese folding bike. I clearly underestimated the difference this makes. As I overestimated my fitness level. And again and again, I underestimated the drag luggage adds. I am carrying a large saddle bag and a mini backpack. It includes warm and alternate layers of clothing – It will get cold above 3000 meters, although I now feel even just a light jersey is too much – and I plan to stay overnight and hike up to the summit before riding down on the other side of the mountain tomorrow, following the only paved road across Taiwan’s Central Mountains. As opposed to the racers, I do not have feed-zones, so I need to bring my own support, lots of water, drinks, and food. Clearly, I packed too less food. I had one bar emergency bar left, and I was wondering if I should consider this an emergency situation now. The restaurant sign on my map turned out to be fruit selling stall, and the fruits look void of any calories. I check again. Next one in three kilometers. That does not seem far, but it only goes uphill from here. It could turn out to be nothing again, and I am depleted. I break off a piece of the remaining energy bar and start pedaling. It turns out to be a real restaurant. A huge plate of vegetables with rice and tofu, an apple, a large cup of ginger tea followed by a large cup of coffee later, I happen to smile again. I spot a handful of the few other riders I meet on my way up. I notice, I see more of them sitting or loading bikes into cars than riding, obviously just warming up or scouting the course for the race on weekend. The landscape is truly impressive and as varied as anything I have seen before. 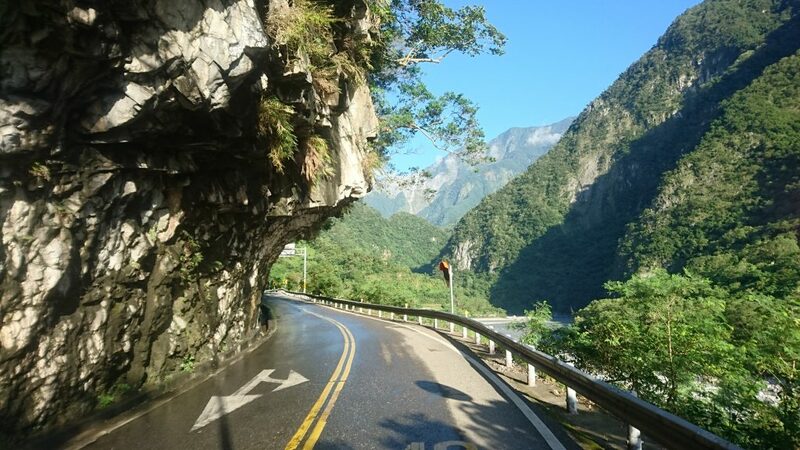 The ride starts with a gentle and long climb through the Taroko Gorge, enormous cliffs towering up to 3000 meters or more on both sides. I pass through on a narrow road and a few dark tunnels. The tarmac is still wet from the heavy rain in the previous days. Water drops down from the rocks everywhere and a number of wild waterfalls crash into the road, creating occasional rainbow arches. Occasionally the less beautiful remains of landslides and rockfall still block parts of the road, turning it into a one-way street. I have to wait until cleanup workers sign me and a few waiting cars the road is clear. Around 4 million years ago, when the Philippine Oceanic Plate and Eurasian Continental Plate collided, thick layers of limestone rock from the ocean rose high up into the sky and the heat and high pressures turned the original limestone rock into marble through the process of metamorphism, while the erosive power of the Liwu river carved the gorge into the marble. To this day, the walls of the gorge are still rising at the rate of about 5 millimeters per year, while the river basin gets deeper and deeper. 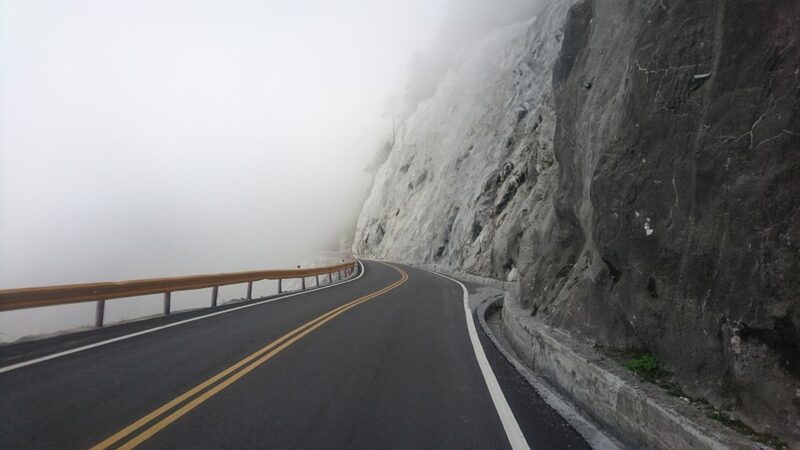 Traversing island of thick fog, the marble-walled canyons turn into a lush green landscape. As a Central-European I am amazed about the landscape, I am used to finding a high-alpine landscape void of vegetation above 2000 meters altitude, but here the trees grow up to 3200 meters or more, creating the illusion of an extensive hilly landscape, the higher I climb. Climate change will drive many species and plants towards even higher elevation. Almost all the bio-geographical zones in Taiwan are represented here, around half of the mammal and butterfly species and roughly 90% of the bird species on Taiwan can be found here in Taroko, some of which are unique to Taiwan, such as the Formosan black bear, now an endangered animal, due to – you guessed it – humans. Illegal hunting and the destruction of their natural habitats drive them further up. “If there were no bears in the mountains, the forest would look empty and I would feel lonely”, an indigenous hunter sums up this and his misery. 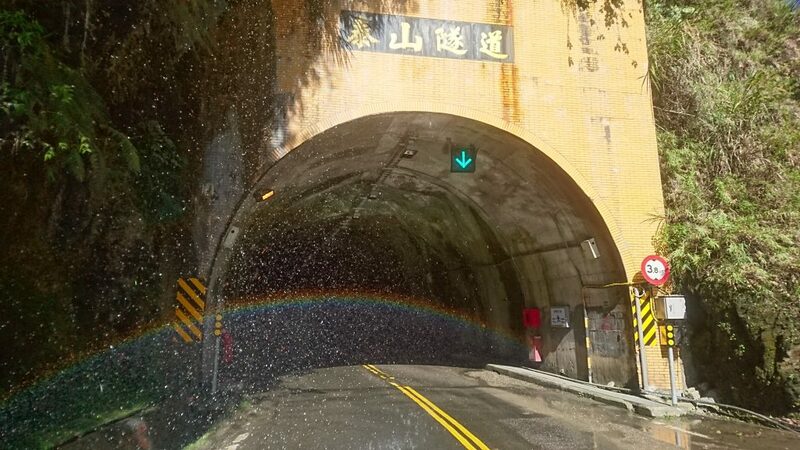 I do not meet the Taiwanese black bear, but I climb up steadily like in trance, despite the road getting steeper and steeper, I don’t mind, going in zigzag from one side of the road to the other. I reach the summit at Wuling just before sunset. A few days later the KOM challenge’s winning rider, the Italian Vincenzo Nibali, will finish the race in less than 3 hours and 20 minutes taking away half a million Taiwanese Dollars (about 17,000 USD) in prize money. Former Tour-de-France winner Cadel Evans will arrive a bit later rounding up the top ten in just about 3 hours 34 minutes. It took me about 10 hours and 30 minutes, breaks included – way beyond the cut-off time for the race, which is 7 hours. Exhausted but happy I enjoy the view, the admiration of the few bystanders and semi-professional cyclist that happen to be around, weighing my folding bike, shaking their heads about the craziness of my attempt. I hurry to ride down again to the only hostel about a kilometer from the top, hoping the still have a bed for me, as I did not book ahead. They do. They also have dinner, buffet-style, eat-as-you can in the hotel next to it. I eat as I had just depleted and destroyed myself. I moan on the way up and down between hostel and hotel, my legs totally sore and tired. I fall asleep early. Next day I wake up just in time for sunrise over the clouds. 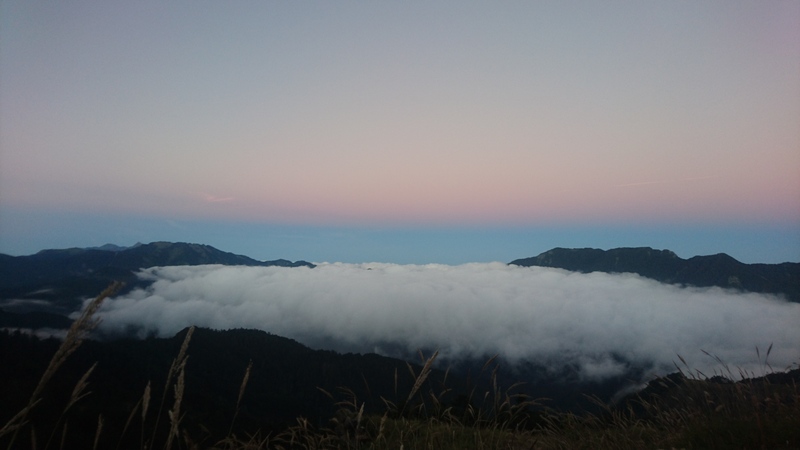 After all-you-can-eat breakfast, I hike up to Hehuanshan’s East Peak. It’s less than half an hour, despite my sore muscles I fly up. I pass the ruins of a ski lift. I cannot imagine snow here, but occasionally it does snow here. When it does, the mountain roads are clogged, I was told because everyone is trying to get up there to see snow. 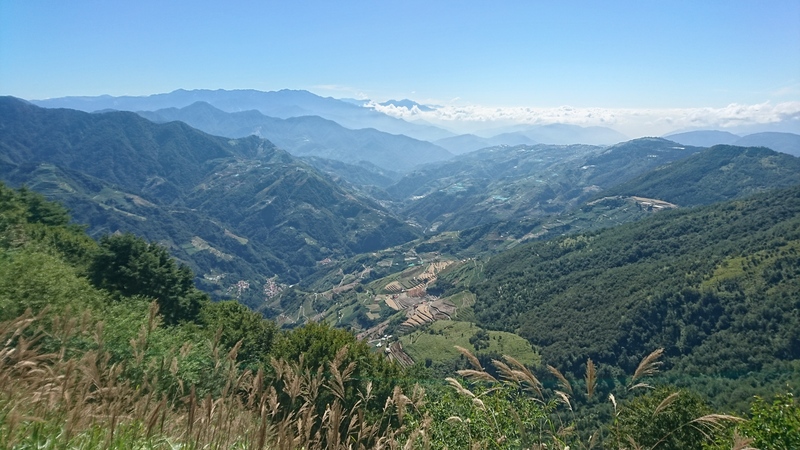 As it seems, it does not snow consistently enough though, to support the commercial viability of a small ski lift, built for the Taiwan elite during material law period. The trail is a staircase with signs every 100 meters. Finally, I complete the feat of my leg-powered climb from sea level at 3421 meters altitude. I even add one more meter by jumping, so I reach up higher than the 3422m high North Peak, which is too far away for me today. I stop again briefly at the pass road’s summit, on my way down on the other side. looking forward to a long well-earned downhill ride. 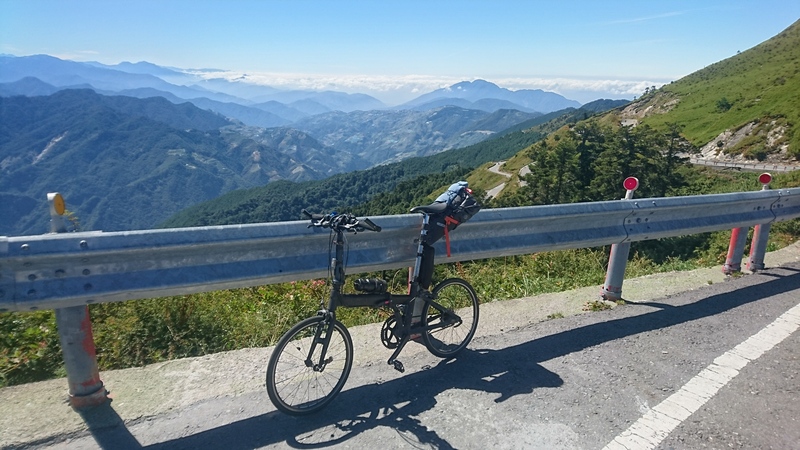 I learn my fame as the craziest guy on top of Taiwan did not last long, a British couple just winds up its last meters on a tandem loaded with what must be at least 20-30 kilograms of luggage. I join the flock of cyclist gathering around them for a chat. Just as we say good-bye and I sit on the bike preparing to let the wheels roll down I notice, to my surprise, I have a flat tire. Easy, I think, as I have a spare. One of the guys around turns out to be a bike mechanic for the race and even has a good pump in his car. I borough a patch kit from the tandem-cyclists (I forgot my own in Taipei) and fix the tube, so I still have a spare. They offer me to leave me a patch kit, I politely decline. This turns out to be a mistake. I keep having flats interrupting my otherwise enjoyable downhill ride until I run out of spares. I do not find anything wrong with the tire, but as I later find out the rim tape has worn out in some places. I am still unsure what the higher heat generated by much smaller wheels and lots of braking adds to that. Luckily I just happen to be in a village. With the help of some local cyclist, I meet at the Seven Eleven, we figure out which bus to take and from where, as I cannot decipher anything. I hop on the bus and doze on and off while it is winding down the mountain. I feel deprived of my well-deserved fun after the long, hard climb. I did not even finish 30 kilometers, not even half the downhill ride. But also I start realizing how tired I really am. “What goes up must come down”, I think changing buses in Puli heading back to Taipei, before I fall asleep again. But quite often it might come down in other ways than expected.